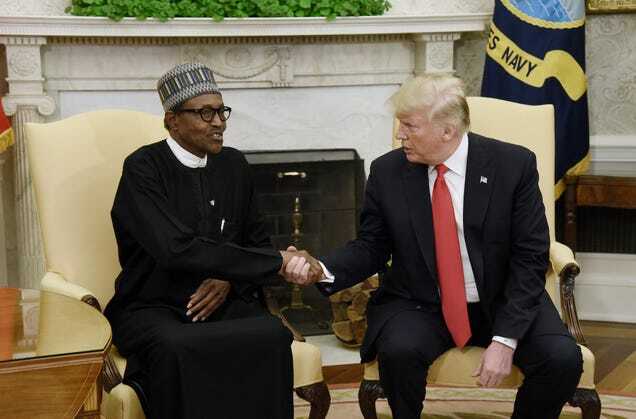 Nigerian President Muhammadu Buhari with President Donald Trump in the Oval Office of the White House on April 30, 2018, in Washington, D.C.
For the first time since Omarosa’s firing, the president is hosting a black person at the White House whose name doesn’t rhyme with Fen Barson. On Monday, the White House staff pulled out the good silverware for Nigerian President Muhammadu Buhari. According to CBS News, the meeting between the president of an advanced country and Donald Trump was expected to focus on economic issues, and it comes some three months after Trump reportedly called African nations “shithole countries” during an Oval Office meeting. Trump reportedly asked, “Why do we want all these people from ‘shithole countries’ coming here?” during the January meeting on immigration legislation. Trump also reportedly claimed in June that Nigerian visitors wouldn’t want to return to their “huts” if they came to the U.S. The White House has since denied those reports, calling the claims “outrageous,” CBS News reports.